The Red Baron peach is a classic example of the popular fruit. The fruit is a late season freestone with outstanding flavor. 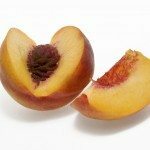 Growing Red Baron peaches isn’t particularly difficult, but young trees need some help to establish and develop a good form. Red Baron peach care includes training, watering and feeding needs. We’ll give some important Red Baron peach info to help your plant get off to a good start. 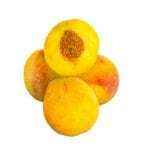 Red Baron peaches are widely available in supermarkets because they don’t transport well. These delicate fruits are popular home orchard plants, and bloom and produce prolifically. In fact, the production is so high, culling the blossoms to minimize fruit per stem tip is advised for better fruit size. That being said, with a little care, harvesting Red Baron peaches in August and taking those first bites is one of the highlights of the summer. Red Baron peach trees thrive in United States Department of Agriculture zones 6 to 10. This peach tree produces huge double petal, deeply red flowers in spring. Red Baron peach trees require 250 chill hours and are self-fruitful. The plant grows up to 15 feet (4.5 m.) at maturity with a similar spread, although there are plants on semi dwarf rootstock that will be smaller. The fruits are deeply red with bright yellow flesh and run about 3 inches (7.5 cm.) in size. The flavor is sweet with tart overtones and delightfully juicy. This is a fast-growing tree that will produce in just a few years. Trees come either ball and burlap, container grown or bare root. Prepare the area well by incorporating several inches of compost and ensuring good drainage. The site should be full sun and out of strong wind. Avoid planting in frost pockets. Soak bare root trees for several hours prior to planting. Build a little pyramid of soil at the bottom of a hole that is twice as wide and deep as the roots. Settle the roots on top of this pyramid and back fill, packing the soil around the roots. Water plants in well. Prevent weed pests and keep moderately moist. Provide a tree stake during the first two years so the central leader stays straight and strong. Young plants will need some pruning guidance initially to develop strong branches. Train the tree to an open vase-like shape. Water approximately three times per week in the summer. Feed the tree in spring at bud break with a balanced fertilizer. Watch for pests and disease. Probably the most common diseases are fungal and can be prevented by early application of fungicide. In some areas, various animals can pose a danger to the trunk. Use caging around the tree for the first few years if you have those types of problems. With minimal care, you will be harvesting Red Baron peaches in just 3 to 5 years and for years after.